Most facing pages are not printed side by side; they come together only when the sheet of paper is folded. Each signature does have two facing pages that are printed side by side, called a natural spread. Although many yearbooks feature page designs in which photographs bleed across the gutter on most spreads, only on the natural spread is it guaranteed that the photographs and any graphics such as rule lines will line up exactly. While that is a good explanation of flats and signatures, they are more easily explained in a demonstration. So let each of your staff members create a signature by folding a piece of paper into a small 16-page book, number the pages and unfold the sheet. The two sides will look like the diagram. Fold an 8 1/2″ x 11″ sheet of paper in half, short sides together and facing right. Fold in half again. Fold down, short sides together and facing down. Fold in half again. Fold so the left side goes behind and meets the right side, short sides together. Now you are going to number the “pages” from 1 to 16 at the bottom. The bottom is the short side with the most access to what will be pages; the “top” will have two folds. Starting with the front page, place a number 1 on the bottom right corner. Peel back the next page and place a 2 on the bottom left corner, so it is on the back of the 1. Proceed to number the subsequent right and left corners, until you get to 16 on the back. Because of some folds, it will be difficult to place the numbers 10, 11, 14 and 15; you may have to unfold slightly to reach the corners. When you are done, unfold the paper. 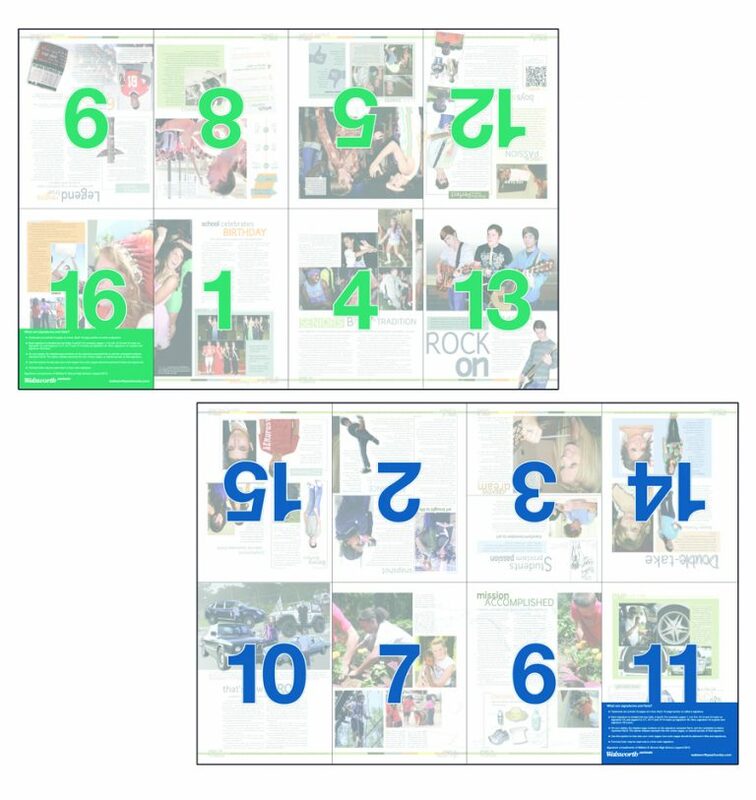 You will see the pages of flat A, including page 1 and the natural spread of pages 8 and 9, on one side. The pages of flat B are on the other side. Both sides make up the first signature of a book. There are several reasons that it is important to pay attention to flats and signatures. First, it is essential to your budget that you plan your spot and four-color pages carefully. Ink is applied to all of the pages in a flat at one time. Each time another ink color is applied, costs increase. It is more cost effective to have eight pages of spot color on one flat than four flats with two pages each of color. Try to keep color within the pages of the same flats. On some deadlines, fewer pages can be submitted if you submit completed flats. For example, let’s say for your first deadline you are required to submit 48 pages, which would equal six flats. Those 48 pages can come from any flats. However, you could submit five completed flats, which would only be 40 pages. Just remember, while that might help you out at a specific deadline, by your final deadline, all pages must by submitted. Check with your yearbook sales representative for details.